Our spacious 3 sided beach cabana is 9 ft wide and 6 ft deep and offers highly resistant UV protection. 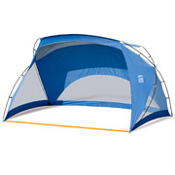 Tent poles help keep it grounded when on the beach or in the backyard. Colors and styles may vary.